Could the best leaders be the ones who make everyone ELSE smarter? 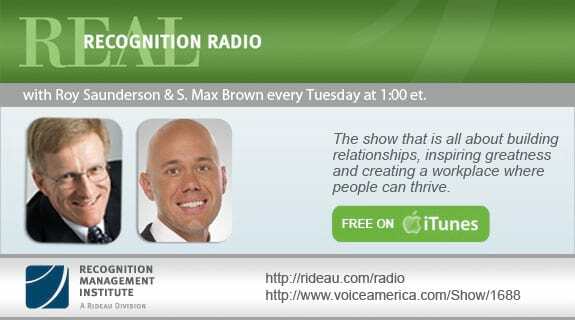 Liz Wiseman and Greg McKeown authors of Multipliers: How the Best Leaders Make Everyone Smarter join hosts Roy Saunderson and Max Brown on this episode of Real Recognition Radio to shed some light on the subject. Discover these new types of leaders and find out how you yourself can become a leader than inspires those around you to create a better workplace! Liz Wiseman is president of The Wiseman Group, a leadership research and development center headquartered in Silicon Valley. She advises senior executives and leads strategy and leadership forums for executive teams worldwide. A former executive at Oracle Corporation, she worked as the Vice President of Oracle University and as the global leader for Human Resource Development for 17 years. Greg McKeown is the author of the best-selling book Essentialism: The Disciplined Pursuit of Less. Greg writes, teaches, and lectures around the world on the importance of living and leading as an Essentialist. He has spoken at companies including Apple, Google, and Facebook and is among the most popular bloggers for the Harvard Business Review and LinkedIn’s Influencer Group. He co-created the course “Designing Life, Essentially” at Stanford University and serves as a Young Global Leader for the World Economic Forum. Greg holds an MBA from Stanford University. Learn more at GregMcKeown.com.